Nebraska lost about 55 percent of its running back production from last year with the graduation of two-year starter Terrell Newby. The coaches have been somewhat inconsistent with their running back rotation since arriving in Lincoln, but Newby was the one guy they seemed to rely on. Now he’s gone, throwing the door wide open and creating a true competition at Nebraska for the first time in a long time. Last year during the spring and fall, Newby, Devine Ozigbo and Mikale Wilbon all split the practice reps with the top units, but when the season rolled around Newby was the one who emerged to carry the load. Does Nebraska have a true bell-cow back on the roster now? That remains to be seen. 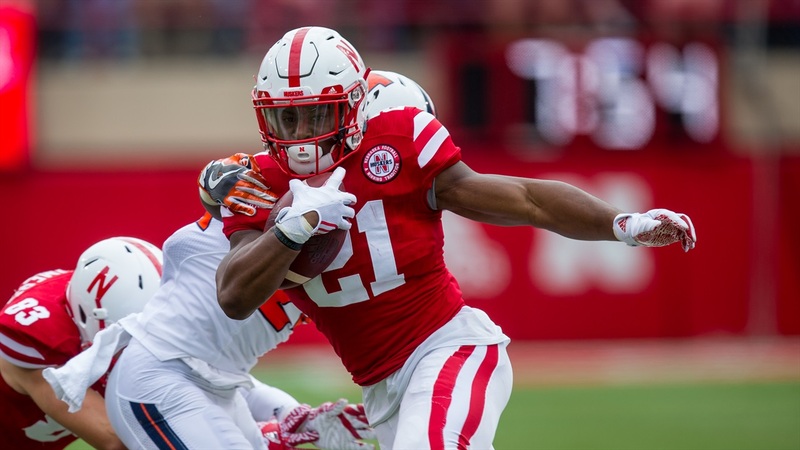 Ozigbo, Tre Bryant and even Wilbon have all shown flashes of what they can do, but through a combination of lack of opportunity, injury and performance, none of the three managed to carve out a consistent and significant role. Each of them brings a different skill set to the field, and running back should be one of the most interesting position battles to watch this spring. Ozigbo figures to get the first crack at the job as a big back with nimble feet now has two years in the program. He saw double digit carries in each of the first five games, but got banged up midseason and missed three of the final seven Big Ten games and totaled just 14 carries in the other four. He closed out the season with a strong seven carries for 66 yards in the bowl game against Tennessee. Ozigbo is a big, strong back and is the most experienced player in the backfield despite entering just his true junior season. Bryant handled kickoff return duties all year, but the freshman saw his role on offense change throughout the season. Bryant carried the ball 12 times for 70 yards and a touchdown during his first two games, then got the ball just seven times over the next eight games. He closed out the season with 24 carries for 97 yards before sitting out the bowl game. Bryant offers a more dynamic style than Ozigbo does with breakaway speed, but he showed some ball security issues with a few fumbles. Wilbon didn’t play much of a role as a runner with one or zero carries in six of his 10 games. The Chicago native did have the most productive game of his career at Northwestern with six carries for 55 yards, but that accounted for most of his season production. Wilbon is probably Nebraska’s most dynamic runner, but for whatever reason the coaches have yet to entrust him with a significant role on the field. Nebraska has two other running backs on scholarship for the spring semester – Adam Taylor (6-foot-2, 210 pounds) and Austin Rose (6-foot-1, 225 pounds). Taylor arrived in Lincoln with plenty of hype, but found bad luck on the injury front and has never been able to see the field on offense since recovering. Rose is a local product who was placed on scholarship for the spring after starting out as a walk-on. He had an impressive showing in spring ball and fall camp last year. Both players could be looked at as depth behind Ozigbo as power backs. Bellevue West product Jaylin Bradley will join the team in the summer and add another factor to the equation, but he obviously will not participate in spring ball. Luke McNitt (6-foot-2, 240 pounds) made the transition to fullback from tight end and won a three-man battle last season to start at fullback, but he only saw the ball twice all season. With Andy Janovich off to the NFL, the coaches took most of the full-back run plays out of the playbook. However, he looks to be the favorite to hold onto his role as a senior as the biggest and most experienced option at the position. Walk-on Harrison Jordan (5-foot-100, 230 pounds) was also part of that competition last year and provides a more traditional battering ram type of full back. Freshman Ben Miles will have a chance to earn a role when he arrives on campus, but he will not participate in spring ball. Back to full health, Ozigbo looks to be the early favorite to take over for Newby as the starting running back. However, if Bryant has learned how to take better care of the ball and improved his understanding of the playbook, he could easily see a significant amount of carries. As for Wilbon, it seems like it’s now or never for the redshirt-junior-to-be after showing flashes but never truly earning a consistent role during his first two seasons. Regardless of who wins the job, all three offer the ability to catch the ball out of the backfield as well as take hand offs, and most of Bryant and Wilbon’s snaps came in a split-backs set with one or both running a wheel route out of the backfield. Regardless of who wins the job, Nebraska has the talent to get what it needs out of the running game – so long as the backs get the blocking they need up front. For a closer look at other position groups, check out our spring football preview on the quarterbacks and linebackers.